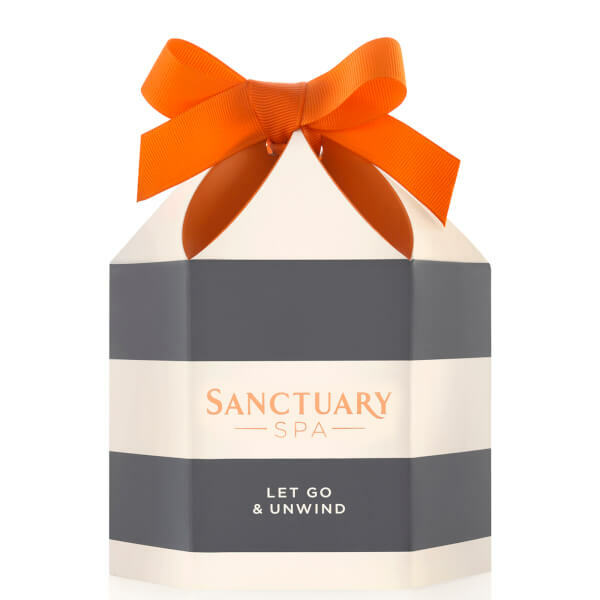 The Sanctuary Spa Let Go and Unwind Gift Set combines a trio of nourishing skincare treats to leave your body feeling soft, nourished and pampered. Housed in a ribbon-topped gift box with shower puff. No animal testing. Vegan friendly. A refreshing formula that transforms into a delicately scented foam to cleanse and soften from top to toe. Enriched with essential oils and gentle Jojoba beads, the weightless formula will leave the body feeling silky smooth and moisturised with a sensuous, floriental fragrance of Patchouli, Sandalwood and Jasmine. Free from parabens and microbeads. A daily body scrub that gently polishes and exfoliates with natural pumice. Smoothing and refining, the gel-scrub gently sloughs away dead skins cells and is delicately perfumed with essential oils for an uplifting and refreshing cleansing experience. Skin is left feeling soft, smooth and supple. Free from microbeads. A rich and indulgent body butter infused with Shea and Cocoa Butter for a comforting and nurturing effect. Melting effortlessly into skin, the body butter delivers a cocoon of luxurious softness, infusing skin with Sweet Almond and Macadamia Nut Oil to leave the body feeling soft, supple and nourished. Body Wash: Massage onto wet skin and rinse. For best results use with a shower puff. Finish your shower with a blast of cold water to close pores and awaken your senses. Body Scrub: Vigorously work the polish into damp skin in the bath or shower and rinse. Finish your shower with a blast of cold water to close pores and awaken your senses. Body Butter: Massage generously into skin before dressing to leave your limbs feeling butter-soft. Warning: Do not use on face. Avoid contact with eyes. If the product gets into eyes, rinse well with warm water immediately. Body Wash: Aqua (Water), Sodium Laureth Sulfate, Glycerin, Acrylates/C10-30 Alkyl Acrylate Crosspolymer, PEG-40 Hydrogenated Castor Oil, Phenoxyethanol, Sodium Benzoate, Sodium Hydroxide, Parfum (Fragrance), Benzyl Alcohol, Butyl Methoxydibenzoylmethane, Propylene Glycol, Sesamum Indicum (Sesame) Seed Oil, Aluminum Starch Octenylsuccinate, Agar, Simmondsia Chinensis (Jojoba) Seed Oil, Tocopheryl Acetate, Chlorphenesin, Mica, Polyquaternium-39, Tin Oxide, Hexyl Cinnamal, Linalool, Limonene, Benzyl Salicylate, CI 73360 (Red 30 Lake), CI 15985 (Yellow 6), CI 77891 (Titanium Dioxide), CI 16035 (Red 40), CI 42090 (Blue 1). Body Scrub: Aqua (Water), Sodium Laureth Sulfate, Glycerin, Silica, Pumice, Acrylates/C10-30 Alkyl Acrylate Crosspolymer, PEG-40 Hydrogenated Castor Oil, Phenoxyethanol, Sodium Benzoate, Parfum (Fragrance), Benzyl Alcohol, Sodium Hydroxide, Hydrated Silica, Butyl Methoxydibenzoylmethane, Hexyl Cinnamal, Linalool, Limonene, Benzyl Salicylate, CI 77891 (Titanium Dioxide), CI 15985 (Yellow 6), CI 16035 (Red 40). Body Butter: Aqua (Water), Glycerin, Cetyl Alcohol, Ethylhexyl Stearate, Isopropyl Palmitate, Propylene Glycol, Glyceryl Stearate SE, Cyclopentasiloxane, Glyceryl Stearate, PEG-100 Stearate, Palmitic Acid, Parfum (Fragrance), Caprylyl Glycol, Stearic Acid, Carbomer, Phenoxyethanol, Sodium Hydroxide, Benzophenone-4, Prunus Amygdalus Dulcis (Sweet Almond) Oil, Tocopheryl Acetate, Butyrospermum Parkii (Shea) Butter, Macadamia Integrifolia Seed Oil, Theobroma Cacao (Cocoa) Seed Butter, Tocopherol, Hexyl Cinnamal, Linalool, Limonene, Benzyl Salicylate, Benzyl Benzoate, Coumarin, Citral, CI 19140 (Yellow 5), CI 15985 (Yellow 6), CI 14700 (Red 4).